Note: the performance mentioned below is cancelled because of rain and the threat of lightning. Sorry! 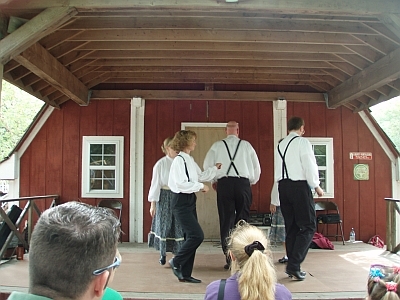 The next performance of the Back Porch Cloggers will be Saturday, June 12 at 11am at the Deanna Rose Children's Farmstead. 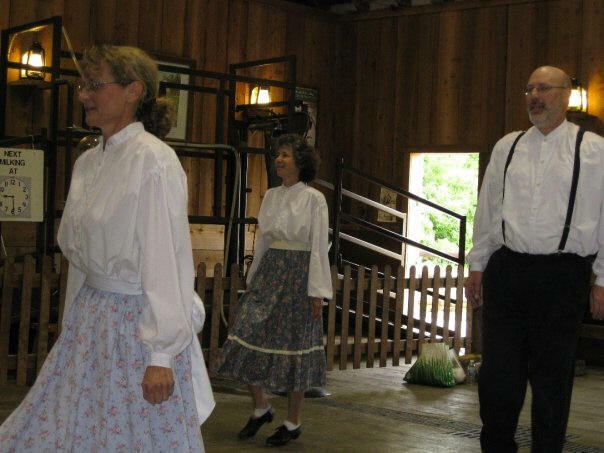 We'll be performing in the Dairy Barn. 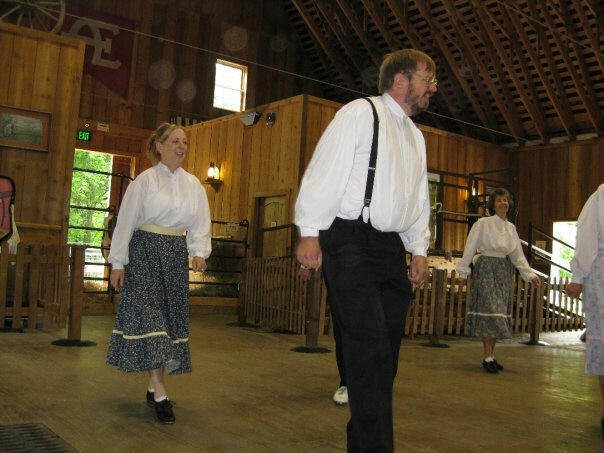 In January of 2000, I took lessons on Appalachian Clogging from a group called the Back Porch Cloggers. I persisted through the entire fifteen weeks, graduated and then took the beginning courses a second time as well as continuing with the advanced group. 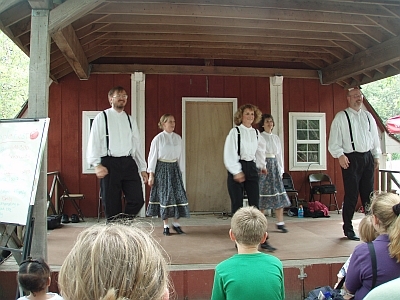 Eventually, I got good enough that I was invited to be part of the performing group. 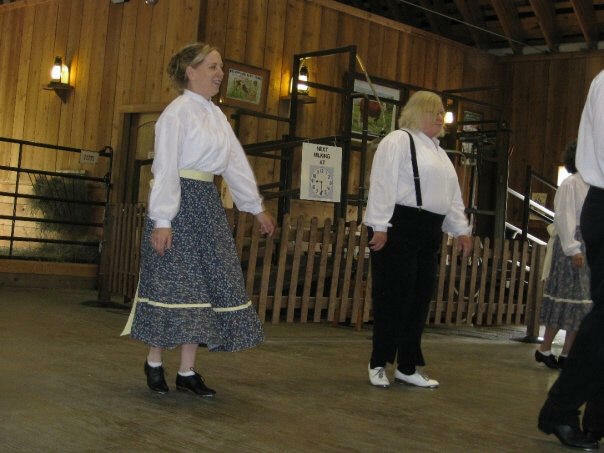 The performing group would go monthly to various locations such as local festivals and to nursing homes and perform some of the more advanced dances. 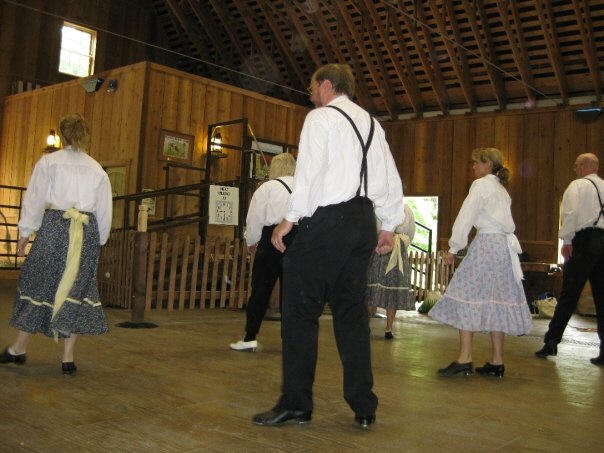 The leader of the Back Porch Clogges, John Hardin, retired in 2006, but the members of the group still kept meeting irregularly to keep practicing the dances so we wouldn't forget them. 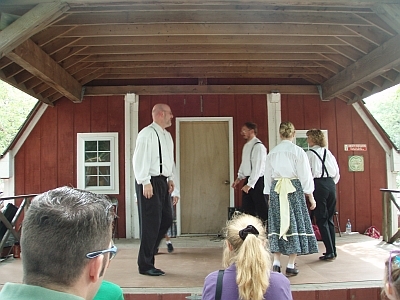 We also found time to hold several performances at the Deanna Rose Children's Farmstead. 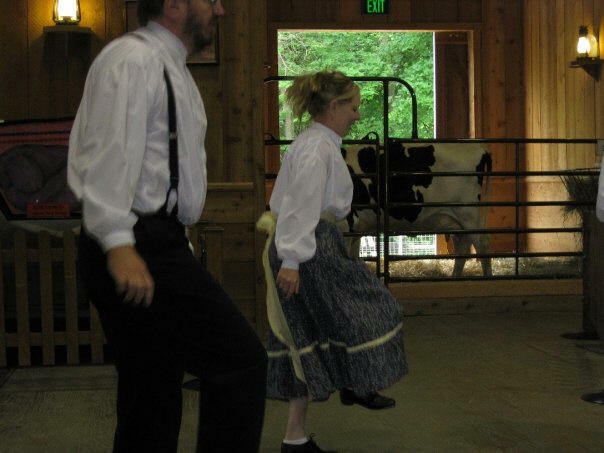 We do a few dances and then invite the children up (and any brave adults) to practice a few very simple clogging steps. Here are some pictures from a performance last year. 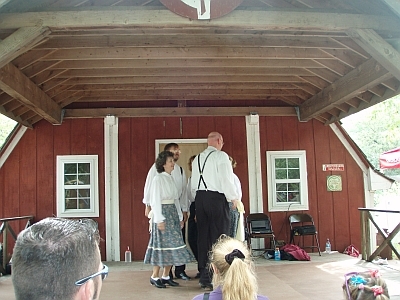 I'll try to identify all the dancers, but will not name anyone who is hidden behind another dancer. By the way, Nancy Berman provided most of these pictures. Thanks Nancy! Left to right: Sandy Files, Steve Simon, and Brent Fulton. 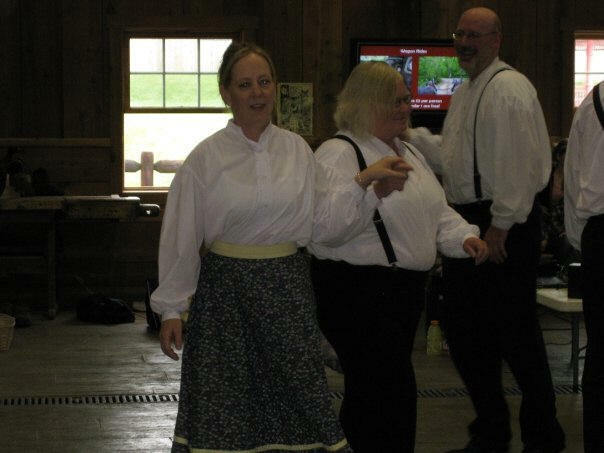 Left to right: Nancy Holloway, Joann Wedbush, Brent Fulton. Left to right: Steve Simon, Sandy Files. Left to right: Sandy Files, Nancy Berman, Steve Simon, Nancy Holloway, Brent Fulton. Left to right: Sandy Files, Steve Simon. Left to right: Sandy Files, Nancy Berman. Left to right: Sandy Files, Steve Simon, Joann Wedbush. Left to right: Sandy Files, Nancy Berman, Brent Fulton. 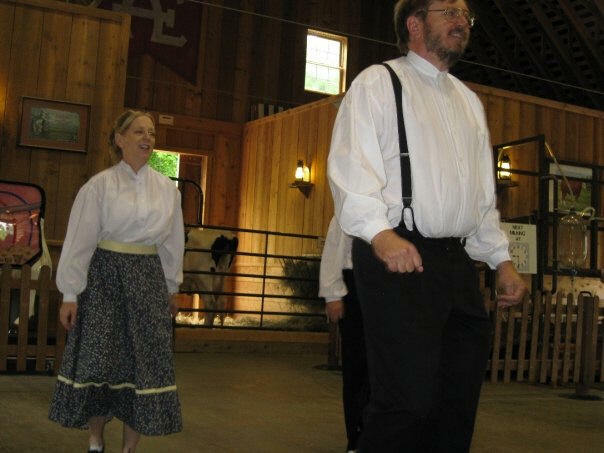 Notice that Nancy is playing the man's role in this couples dance. 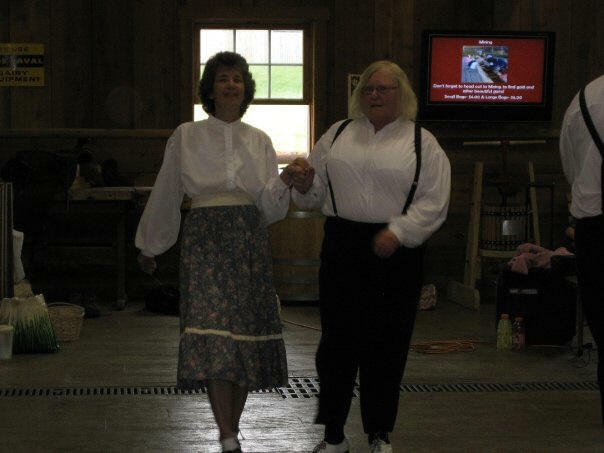 Left to right: Joann Wedbush, Nancy Berman. 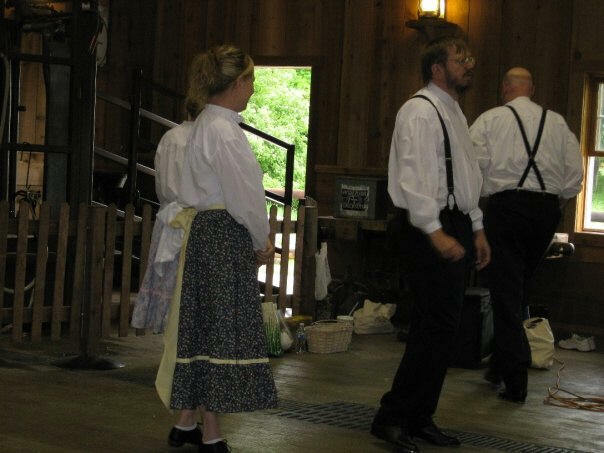 Here are some more pictures from a performance two years ago. Left to right: Brent Fulton, Steve Simon, Sandy Files, Nancy Holloway. Left to right: Nancy Holloway, Brent Fulton, Steve Simon. 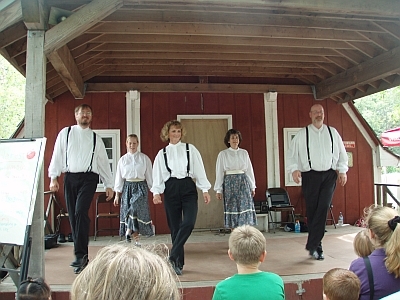 Left to right: Joann Wedbush, Steve Simon, Brent Fulton. Left to right: Steve Simon, Sandy Files Nancy Holloway, Joann Wedbush, Brent Fulton.